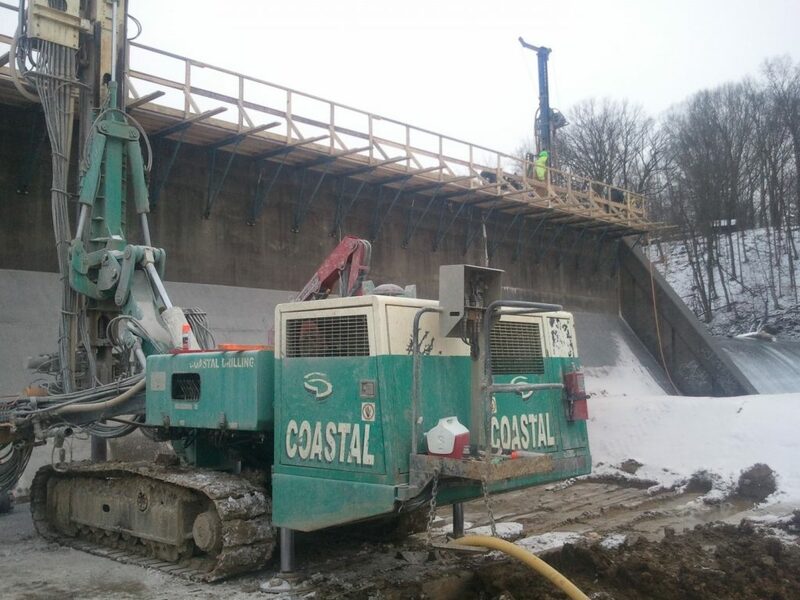 The installation of 28 permanent rock anchors and 109 passive dowels on the face and crest of the dam associated with the remediation efforts to improve dam stability. The structure is under the governance of the state Fish and Boat Commission and serves as a recreational opportunity for the region. The rock anchor design included staggering the elevation of the bottom of the anchor bond zone to avoid laminar (tensile) bedding joint failure in the foundation rock. The bond zone was set deep enough so that the anchor capacity did not exceed the mass of submerged rock that was engaged by the anchor, based on theoretical overlapping cones with an apex angle of 90 degrees. The anchor locations and sequence of stressing were staggered to avoid buildup of excess stress concentrations in the concrete monolith(s). 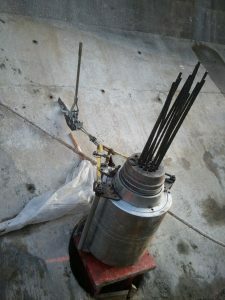 The rock anchors were provided with double corrosion protection. The lake is currently owned and operated by the state Fish and Boat Commission and serves as a recreational facility. The state Department of Environmental Protection (DEP) has identified the dam as DEP Number D63-053E. 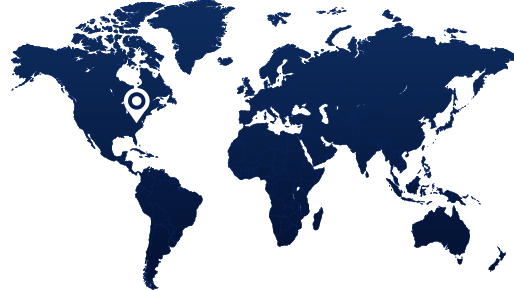 The dam is classified as a gravity dam and was constructed back in the early 1940’s to provide process water to the Alcoa Forging Plant during World War II. 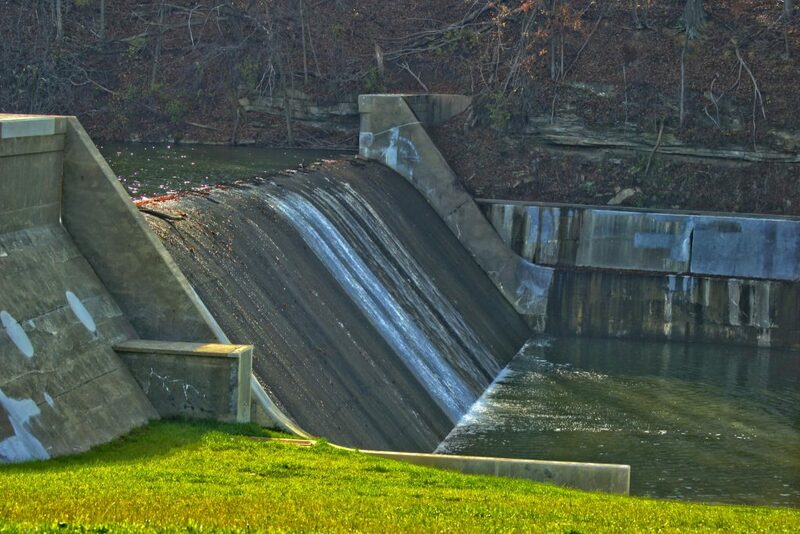 In the late 1950’s the dam was purchased by the state and placed under the administration of the state Fish and Boat Commission. The dam consists of twelve (12) concrete monoliths. 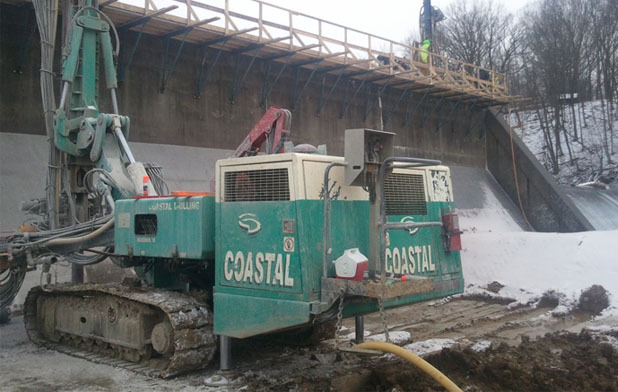 Coastal was contracted to provide both double protection coated multi-strand anchors as well as passive rock dowels. 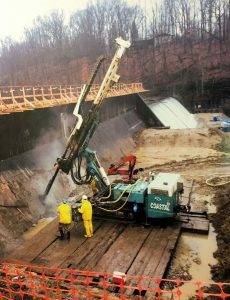 The project began by drilling pilot holes to sufficient depth and using them to construct the anchor pocket. 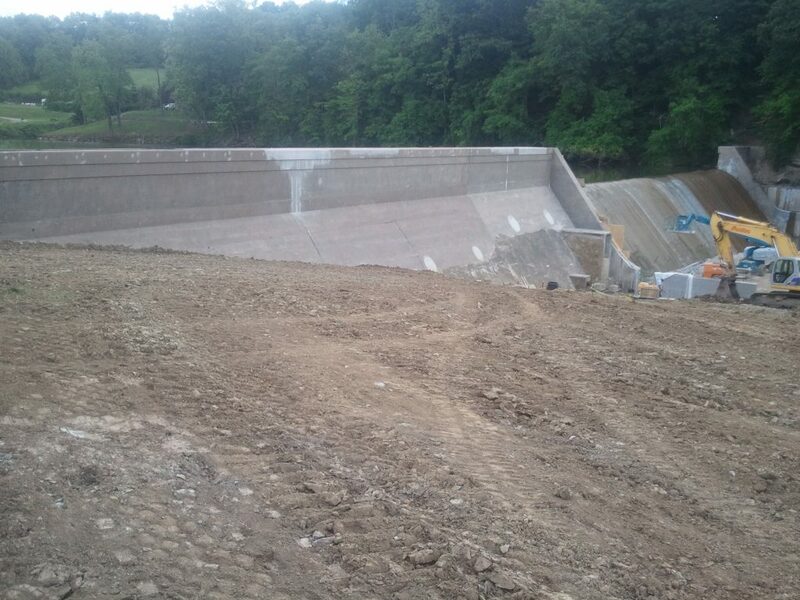 The guide sleeves were then installed into the existing dam and grouted in place. Upon grout cure, the remaining length of the anchor hole was drilled into competent rock. The holes were then cleaned and water pressure tested and, upon achievement of requirements, the anchors were set in place. 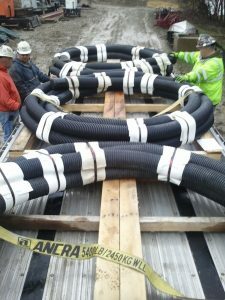 The design called for 14-28 strand anchors to handle loads from 410 to 703 kips. 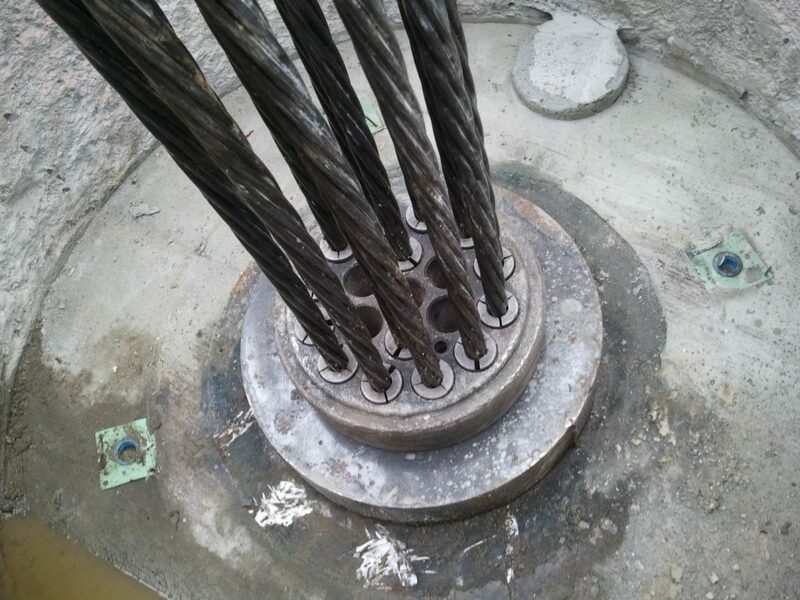 Upon placement, the strand anchors were primary grouted and the bearing plates and anchor heads were installed. Once the grout reached a minimum strength, the rock anchor was tested and locked-off. Second stage grouting through the anchor head was placed to fill the remaining anchor. Finally, the remaining anchor pocket was filled with non-shrink grout upon acceptance of the anchor.